Heritage's revival as a respected academic subject has, in part, resulted from an increased awareness and understanding of indigenous rights and non-Western philosophies and practices, and a growing respect for the intangible. Heritage has, thus far, focused on management, tourism and the traditionally 'heritage-minded' disciplines, such as archaeology, geography, and social and cultural theory. Widening the scope of international heritage studies, A Museum Studies Approach to Heritage explores heritage through new areas of knowledge, including emotion and affect, the politics of dissent, migration, and intercultural and participatory dimensions of heritage. Drawing on a range of disciplines and the best from established sources, the book includes writing not typically recognised as 'heritage', but which, nevertheless, makes a valuable contribution to the debate about what heritage is, what it can do, and how it works and for whom. Including heritage perspectives from beyond the professional sphere, the book serves as a reminder that heritage is not just an academic concern, but a deeply felt and keenly valued public and private practice. This blending of traditional topics and emerging trends, established theory and concepts from other disciplines offers readers international views of the past and future of this growing field. A Museum Studies Approach to Heritage offers a wider, more current and more inclusive overview of issues and practices in heritage and its intersection with museums. 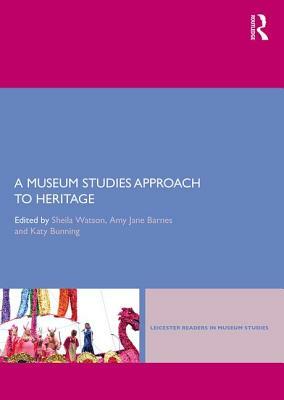 As such, the book will be essential reading for postgraduate students of heritage and museum studies. It will also be of great interest to academics, practitioners and anyone else who is interested in how we conceptualise and use the past. Sheila Watson is an Associate Professor and Director of the MA/MSc in Heritage and Interpretation by Distance Learning in the School of Museum Studies at the University of Leicester, UK. Amy Jane Barnes is Research Associate in the School of Archaeology and Ancient History at the University of Leicester, UK, a University Teacher at Loughborough University, UK, and an affiliate of King's College London. Katy Bunning is a Lecturer and Director of Teaching and Learning in the School of Museum Studies at the University of Leicester, UK.